JONAS DVD Bonus Episode - Cold Shoulder. . Wallpaper and background images in the দ্যা জোন্স্‌ ব্রাদার club tagged: joe jonas nick jonas kevin jonas jonas brothers. This দ্যা জোন্স্‌ ব্রাদার photo contains ব্যবসা উপযোগী. Jonas brother camp rock 2 photoshot! Young jonas brother photoshot ! Nick Jonas: Family Fun দিন (09.02.2011) !!! Nick Jonas & Delta Goodrem: Bowling তারিখ (08.02.2011) !!! nick's album covere "who am I "
Nick Jonas & Delta Goodrem: সঙ্গীতানুষ্ঠান Going Couple (08.17.2011) !!! 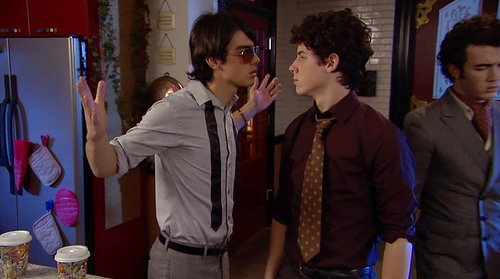 Joe Jonas biting Kevin Jonas's...uh...ear??? World Tour.31/08/09 Ottawa. Last সঙ্গীতানুষ্ঠান of WT !